We are thrilled to welcome Paper Bag Records for a night of music on the Roy Thomson Hall Patio. Join us for music, prizes, full cash bar and a Paper Bag Records pop-up shop. July 14 is release day of The Dears new album Times Infinity Volume Two. In celebration Natalie and Murray will perform a special one time only set with string quartet. 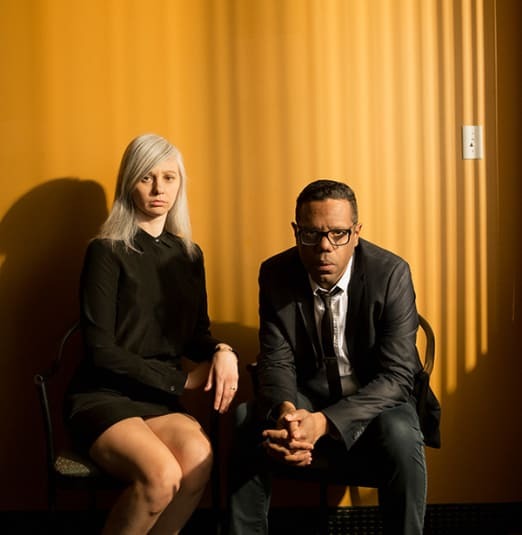 An “orchestral-pop-noir-romantique” rock'n'roll band from Montréal, founded by Murray A. Lightburn in 1995, and joined by Natalia Yanchak a few years later, The Dears are shaped equally by nineties rock and a broad tableau of gospel, soul, and pop music. The themes covered on their latest work (sixth and seventh albums) Times Infinity Volume One and Times Infinity Volume Two, respectively, are generally “Romantique” — familiar territory for The Dears; unconditional love, longing, and a debilitating fear of loneliness. The band notes that Volume Two is the “much darker” installment of the pair. Special Guest Lou Canon kicks off the evening festivities. The singer and multi-instrumentalist has emerged as the vanguard of Toronto’s bedroom electronic movement. With her enveloping, downtempo music, Lou has created a vibe steeped in style, self-assurance and effortless mystique.